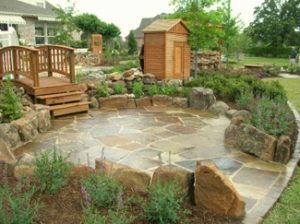 Whether you are looking to sell your home or simply want to enjoy your yard space, patio construction can help complete your landscaping. At Blooms Landcare, we know how to help you stay within your budget while at the same time creating a beautiful outdoor space. Make an investment in your yard – and your happiness – by adding a beautiful patio. According to a 2007 survey conducted by the National Association of Realtors, patios were among the top 10 features buyers look for in a new home. Essentially, a patio is a bonus living area that does not need to be heated or cooled, and is well-designed space that can be easily maintained and provide you both short-term and long-term benefits. In terms of patio construction, there are a few rules to abide by to make sure you get the most from your space. For example, the patio should not be a standalone structure. It should be close to an entry to your home, strategically located by a door that leads into a kitchen. If you enjoy privacy, consider adding natural fencing to your Fort Worth construction plans, with large shrubs or trees. This will keep nosy neighbors out of your business while adding to the aesthetic value of your patio. Lastly, your patio should be proportionate to your yard. Professionals can help you determine the right size for your space. Consult our team at Blooms Landcare, where we can help design an outdoor space you can enjoy for years to come and potential buyers will find attractive. Contact us at (817) 688-5352 to begin your patio construction today.